Preston’s tram line took another step forward this week when Eric Wright Civil Engineering Ltd signed a Memorandum of Understanding to participate in the route. There will be a sod cutting ceremony for the tram test line in Deepdale on Tuesday 9th January 2018. The test roue will be a 1250 metre track in Deepdale which received planning permission in November 2016. 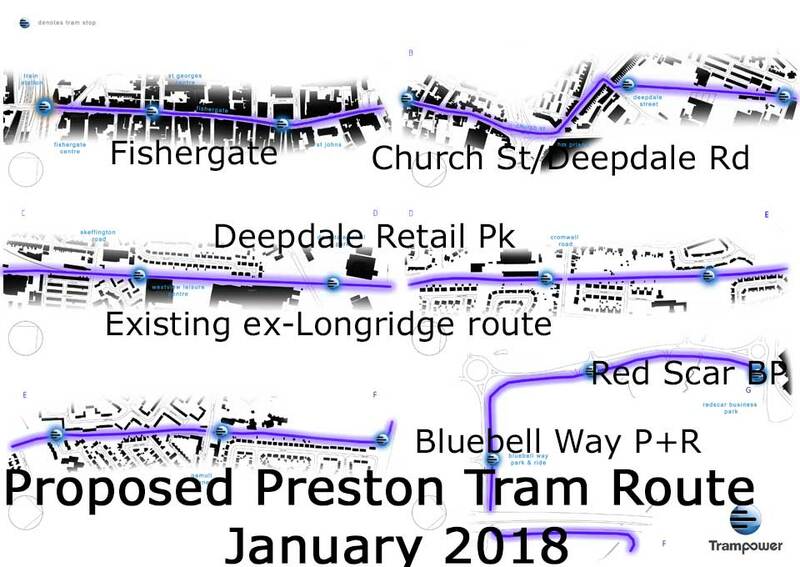 The full Guild Tram route proposed will have 16 stops from Red Scar Business Park via Bluebell Way Park and Ride (currently closed), Deepdale Retail Park and Deepdale football ground, Fishergate and for some of the way uses the former Longridge to Preston railway line. Seems a good scheme and using Bluebell Way P+R is a good route into Preston. Not sure if it’s a single or double track route, passing and fitting on Fishergate won’t be ideal. Otherwise trams are clean, fairly quiet and comfortable and can carry a lot of people. This entry was posted in Made in Preston, Rail, Uncategorized. Bookmark the permalink.